Located on the banks of Kham river, the heritage city of Aurangabad is one of the most sought after travel destinations in India. The city, named after the Mughal Emperor, Aurangzeb is a home to the famous Ajanta & Ellora Caves, which have acquired UNESCO World heritage status. Aurangabad also famed by the sobriquet, “The City of Gates” has witnessed the most tumultuous and tragic history in medieval ages. Officially the tourism capital of Maharashtra, the city serves as an opening to Deccan where Aurangzeb spent 26 years of his life fighting the Marathas. Aurangabad is a benevolent city, and this is vindicated by the establishment of Roti Bank, where charity feeds the poor. Initiated by Haron Mukati Islamic centre, volunteers donate a packet of food which is distributed to registered seekers every day. The bank intends to see that no one in the city goes to bed hungry. Now on this January 26, they also have opened Kapda bank, on similar lines. To donate over here, please contact Haron Mukati Islamic centre at Jinsi-Baijipura Road in the heart of the city. With the original name of Khadki, established in 1610 by Malik Ambar, the city witnessed several change of hands and by 1633, was in possession of Mughals. In 1653, Aurangzeb became the viceroy of the region and named it Aurangabad. From there, the city was ruled by Nizams (Of Hyderabad), Marathas & then again back to Nizams, who ruled the city till merger into the Republic of India. localhost/ln-projects/demo/indiantraveller helps you in exploring Aurangabad, the city with a glorious heritage and the most ancient of the artworks that India can boast of. The structure was built in 1678 by Azam Shah, son of Aurangzeb in memory of his mother Dilras Banu Begum. The structure is a striking replica of Taj mahal, also known as Dakkani Taj (The Taj of the Deccan).Bibi ka Maqbara is one of the prominent historic monuments of Aurangabad and one visiting the city cannot afford to miss it. The original name of the place is Devagiri. The fort was believed to be constructed in 1187 AD before Muhammad Bin Tughlak took over and reconstructed it. The fort and the city around served as his capital for a brief period during the 14th Century. It is considered his folly as he re-shifted his capital to Delhi. The fort remains one of the inspiring ones in India with solid architecture and has never lost a battle in its history. It has tower named Chand minar built by 1445 by Alauddin Bahamani to commemorate his capture of the fort. 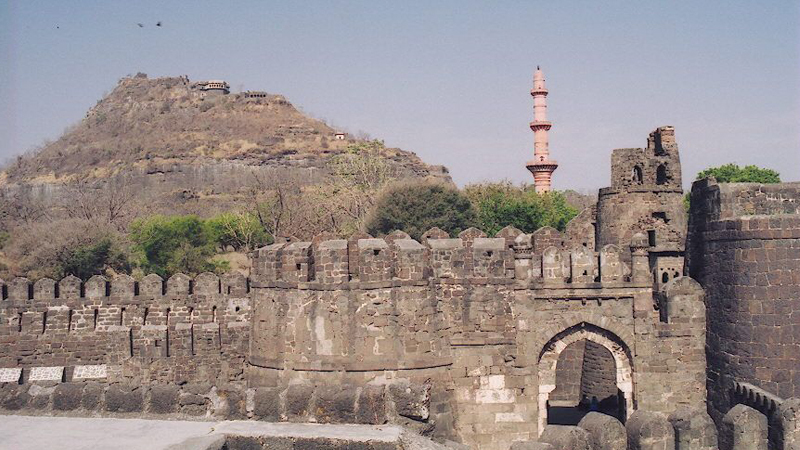 To reach Daulatabad Fort, take the Aurangabad- Ellora road. It is about 20 Km from Aurangabad. The temple enshrines one of the 12 jyotirling. The swayambhu linga, believed to be the last of the 12 jyotirlings is visited by millions of pilgrims & foreign tourists every year. The temple is flanked by Ellore Caves, about a kilometre away. The present day temple with pre-historic architecture, amazing inscriptions was built by Ahilyabai Holkar on the bed of red rocks. It has a 5 tier shikara and contains carvings of Indian gods & goddesses. Maratha style of architecture is striking feature of the temple. Located about 30 Km from Aurangabad, Grishneshwar (Verul village is the exact location) is well connected with buses and private vehicles. Aurangabad airport remains the nearest one. Located at Verul, about a kilometre away from Grishneshwar jyotirling, is the spot of one of the most fascinating archaeological sites in the world, Ellora caves. Ellora caves date back about 15 centuries back to the Rashtrakuta dynasty (Brahmanical & Buddhist caves), and Yadavas (Jain group of caves). Ellora caves, listed among the UNESCO World Heritage sites are indeed the quintessence of rock-cut architecture. There are 34 caves sculpted out of Charanandriand hills boasting of Jain rock cut temples, Buddhist ‘Mathas’ & ‘Viharas’ & Hindu sculpture- all created between 5th century and 10th century A.D.
Cave no 16, Kailasanatha temple is the unmatched attraction of the complex where Mount Kailasa is sculpted out of single stone. Cave no 32- The Indra Sabha (Court of Indra- the god of the gods) has remarkable sculpture including the lotus on the ceiling. The proximity of caves representing 3 different religions at the complex reveals the state of harmony and tolerance for other beliefs and faiths that existed at the old times. The complex is protected by the ASI. Khuldabad homes the nearest government guesthouse. Located amidst gorge of clattering waterfalls, he historical caves of Ajanta are situated about 108 km in the northern direction of Aurangabad and just 55 kilometres from Jalgaon. The site houses 30 rock cut Buddhist caves that have sustained several ages dating back from 2nd century BCE and 6th CE. Five of the caves are ‘Chaityagrihas’ and rest are ‘Viharas’. Breath taking paintings, insurmountable sculpture and intricate architecture are adjectives too low to describe the monuments in words. Archaeological Survey of India describes the paintings of Ajanta as “the finest surviving examples of Indian art, particularly painting”. Jataka tales, Buddhist religious art, life of Buddha, Avadana stories of Bodhisattva are the central themes of the mural paintings. The colours are fresh and vivacious. One would always fall short of words to describe the beauty of Ajanta, another UNESCO World Heritage site, which coupled with Ellora attracts millions of visitors from across the globe every year. Regular bus services from Aurangabad & Jalgaon & special tours from Mashtra Tourism Development Corporation (MTDC) as well as private tour operators ensure connectivity to the amazing rock cut cave complexes. The site is a lesser cousin of Ajanta & Ellora caves, however, not inferior on any aspects. Located deep amidst the Satamala range of Western Ghats of Maharastra, Pithalkhora contains 14 Buddhist rock cut cave monuments dating back to 3rd Century BCE. However, the time has tarnished most of the caves and the remote location denies this collection of painted caves the deserved chunk of visitors. All caves belong to Hinayana period, but the paintings are from Mahayana. Out of the 14, four are chaityas (one housing votive stupas, one apsidal and single-cell) and the rest are viharas. Khuldabad loosely translates into ‘Abode of Eternity’. The village of Khuldabad houses tomb of Aurangzeb. The structure is simple and symbolic of his simple lifestyle. The construction was exactly as per the wish of the Mughal Emperor & funded from the money he had earned from stitching caps. Located about 120 km from Aurangabad, the place is the site of the largest meteor created crater in India. The crater is amongst the top 5 craters on earth, with a diameter of 1.75 Km & maximum depth of 132 Meter. It is estimated that the crater was formed some 50000 years ago due to the impact of a meteorite. The lake attracts hordes of migratory birds like flamingos, coots, moorhens and local birds. The area is beautified by a large number of temples with carvings & sculpture which were built around 12th & 13th Century. The city dedicated to Lord Shani (Saturn), the city without doors is located about 80 Km from Aurangabad. Remarkable aspect of the place- None of the houses, offices, even banks have doors. The place has not recorded any theft till date. Literally meaning Water mill, the monument was developed to grind grains for pilgrims visiting the city. It is an epitome of the scientific thinking process in the medieval architecture in India. It generates energy via water brought down from spring on a mountain which turned the large grinding stones of the flour mill. The monument is attached to the Dargah of Baba Shah Musafir, and is located near Mahmud Darwaza. The monument was constructed in 1695. The city of Gates, Aurangabad boasts of 52 gates, a stand feature among medieval cities of India. Each gate is strongly linked to local history or individuals who contributed to the city. Built by Malik Ambar in 1616, the palace had nine apartments. The interior buildings consisted of five zananas, a Divan-e-aam, a Divan-e-khas, a masjid and a kacheri, each provided with a garden and a cistern. Popularly known as Salim Ali Talab, is located near Delhi Gate, opposite Himayat Baug. During the Mughal period it was known as Khiziri Talab, was renamed after great ornithologist Dr. Salim Ali. In 1692, Aurangzeb ordered a palace to be built and named it as the Killa Arrak. The space enclosed by the Killa Arrak or citadel covered nearly the whole ground between the Mecca and Delhi gates of the city. It had four or five gateways and a nagarakhana for the musicians. Where to shop in Aurangabad? Aurangabad was a major silk and cotton production centre in medieval days. Aurangabad is famous for its’ Paithani sarees. There are a lot of Paithani weaving centres in the city to shop to soothe your heart. Gul Mandi offers amazing shopping experience. Prozone mall is a great option for purchasing everything under the sky. What to savour in Aurangabad? Aurangabad is heavily influenced by Hyderabad and the same implies to the cuisine. Flavourful Pulao, Hyderabadi Biryani,& Mughlai foods are must taste here. Strong influence of herbs and spices is the hallmark of Aurangabadi food. *Naan Qalia- mutton treated with spices is a famous cuisine belonging to Aurangabad and is a MUST TASTE. Have a look at some of the best accommodation options in Aurangabad. Aurangabad is well connected to all major Indian cities via air route. Aurangabad Railway station in on Secundrabad-Manmad section of Nanded division of South Central Railways and has frequent trains running from Mumbai, Nasik, Nagpur, Pune, and Vishakhapatnam among others. By road, NH 11 connects the city with Dhule on one end and Solapur on other.Aurangabad-Mumbai expressway is being developed to link it with the financial capital of India. State highways connecting nearby cities are well developed.